WHAT DOES AN EXHIBITION DO? What Does an Exhibition Do? is a series of seminars exploring what an exhibition actually does, historically and today. In the wake of curating taking shape as a field, many different forms through which art goes public are in use. The exhibition is one of them, perhaps the oldest form for making art public and still important as such. Nevertheless, the primacy of the exhibition is contested when artists and curators seek to follow the needs of the art works rather than a set format, and curating and exhibition-making are being disentangled. In eight seminars a number of aspects of exhibitions and exhibition-making will be discussed. From the history of the exhibition as a format and organising principle for the history of curating and ground-breaking examples of exhibition architecture to transdisciplinary uses of the exhibition and structural expriments with it. Each seminar will include a lecture by an invited guest, followed by a discussion. The speakers include Bruce Altschuler, Dieter Bogner, Celine Condorelli, Clementine Deliss, Jens Hoffmann, Peter Lang, Helena Mattsson, Monika Szewczyk and Tirdad Zolghadr. What Does an Exhibition Do? is organized in conjunction with the exhibition Frederick Kiesler (1890-1965) at Tensta konsthall (11 February-3 May 2015). Kiesler was active within the fields of architecture, painting, sculpture, set design, curating, exhibition architecture, furniture design, journalism, criticism, organizing and teaching. Among his achievements, was the invention of a new kind of exhibition architecture which meant an entirely new way of presenting not only documentary material but also painting and sculpture. The artist and architect Celine Condorelli will contribute to the exhibition, as will students from six different art, architecture and design educations in Stockholm. 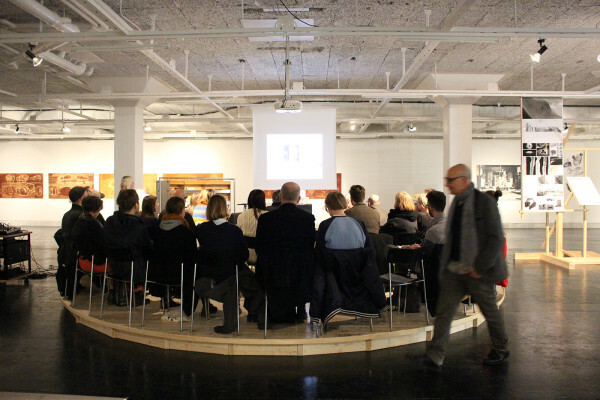 Previous seminar series at Tensta konsthall have been What Does an Art Institution Do? (2011-12), What Does Social Practice Do? (2012), What Does Art Theory Do? (2013) and What Does Art Mediation Do? (2014).